"I really had a blast driving the all new BMW i3 at my local training event. This vehicle was designed from the ground up. It's amazing!" Says the uploader of this YouTube video. 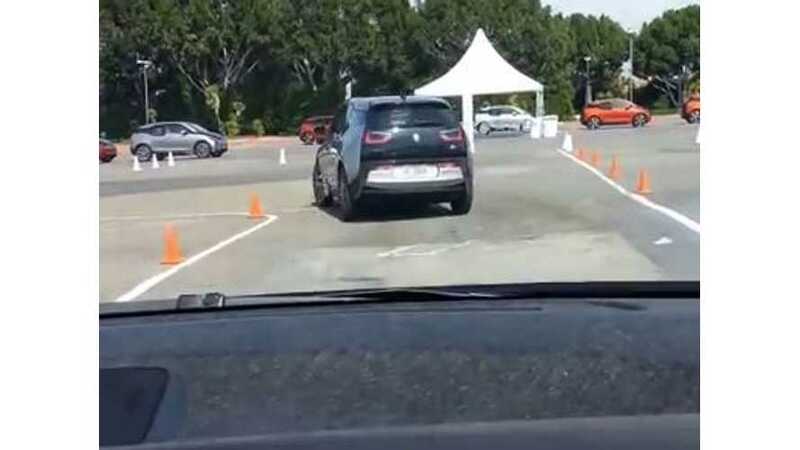 The video quality isn't stellar and it's difficult to get a sense of speed as the BMW i3 weaves around the cones, but what we do catch in this video is that the i3 driver earlier tested the Chevy Volt and that he says the i3 way outperforms the Volt in terms of handling and cornering. The Chevy Volt is not a performance-oriented vehicle, but neither really is the i3. The i3's above average handling and cornering are no doubt related to its low curb weight. So too is the i3's quickness off the line. When weight is kept to a minimum, the fun level increases. It's as simple as that.